As a photographer, Rudy VanderLans has always loved California, the state the Emigre founder made his home after emigrating from the Netherlands in the early 1980s. He has often documented his road trips in photographic projects and Still Lifes, California (2015) was a natural first volume, followed two years later by Still Lifes, U.S.A., recording 3000 miles of car travel. The books are inevitably similar in mood: big skies, empty spaces, roadside dilapidation; overlooked, non-glitzy byways and corners pregnant with downbeat romance and an atmosphere of frustrated hopes. All this emanates from things. VanderLans doesn’t show us the people. Still Lifes, Tokyo, also published by Gingko Press, is the latest volume in series. It is the same landscape format and size as its predecessors and, as before, uses the Emigre typeface Alda by Berton Hasebe. Once again, the book has 256 pages and the last page shows a map, which is simpler this time, since there is only one location. The pictures are the size of postcards. Despite their modest footprint, the books feel solid and substantial, thanks to their hardback binding printed with a picture. 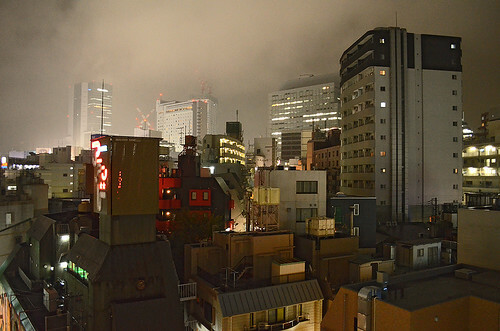 After a two-picture overture, showing a room key and a hotel corridor plastered with photos of a forest, the book is divided into eighteen sections of varying lengths, each beginning with a shot of Shibuya taken from VanderLans’ balcony on the eighth floor, seen in changing light and weather. This structure suggests the rhythm of the passing days, although he says that he abandoned his plan to make a precise sequential arrangement of pictures, as he finessed the flow of images over a period of six months. The two previous volumes presented a single photograph per spread, with a caption on the left to indicate the location. This time VanderLans couples the images wordlessly, making their relationships central to the experience of the book. This device also increases the impression of enclosure and density, as he scours these unfamiliar city streets and twisting alleyways on foot, like a gumshoe with his collar up, hunting for clues. 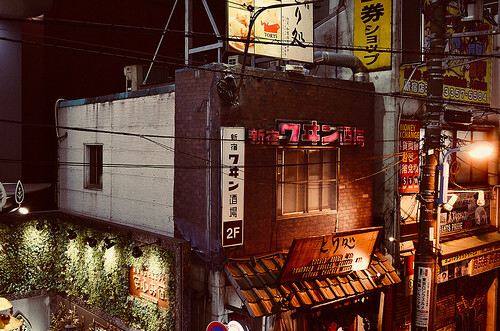 Once again, even in an urban centre thronged with people, there is no one to be seen in these photos, so that it is almost startling when the head of a salaryman making his way along an empty street looms up in front of VanderLans. 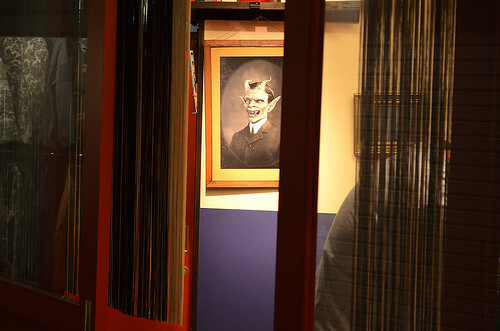 In a picture within a picture of a man wearing a devil mask, it takes time to notice what may be a bending figure concealed behind a semi-transparent drape. Mostly the people are present in the advertising. 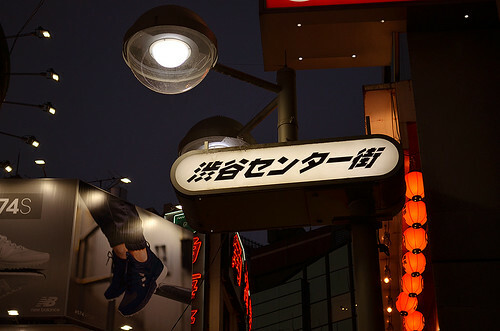 Tokyo, like all modern cities, is a clotted terrain of visual messages. The layering and overload provide an endless supply of accidental montage ready for cutting up and reordering. 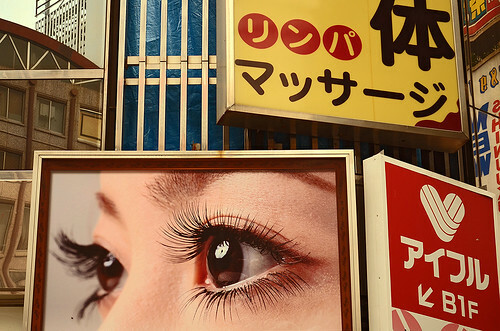 Reading the city in the ‘wrong’ way with the camera, against the mundane grooves of the advertisers’ intentions, generates a paradoxical new kind of beauty, and VanderLans is fully attuned to it. 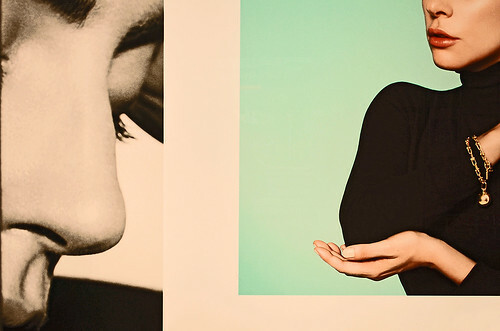 In a picture that isolates a woman’s nose in close-up and another woman holding her elbow, the cupped hand seems, by visual association, to want to cradle the curve of the other’s nose. VanderLans’ sly reframing snips the wires of meaning to defuse the ad and give it an alternative, ultimately nonsensical purpose. This kind of picture made an appearance in Still Lifes, U.S.A., as VanderLans cruised the nation’s highways, stopping off for photoshoots in centres great and small. 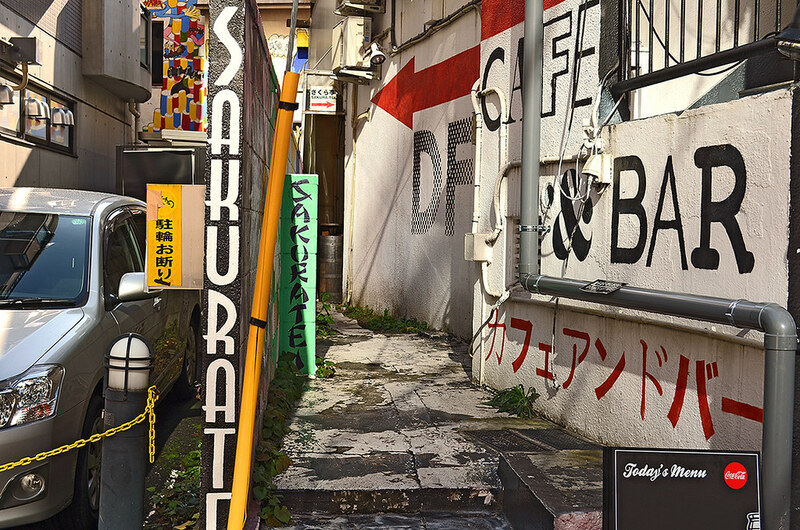 Confined within the seething cauldron of Tokyo, he pushes his collisions and fragments much harder. The pairings provide another level of montage and calculated interaction. Occasionally the intended fusion can fail to ignite when the pictures’ subjects have a similarity that is too obvious, as with a couple of pot plants. The juxtapositions work best when images that are complex in themselves come into contact with other similarly loaded images and achieve an electrical connection of content and form that elevates both pictures and energises the unfolding sequence. It is curious that graphic design, as a field of visual practice with close historical, professional and communicative bonds to photography, should occupy an overlooked, almost subcultural niche when it comes to the making of photographs. VanderLans’ body of work, in particular the later pictures, exhibits some classic concerns of designers’ photography: a preoccupation with flatness, graphic texture, the resonance of letterforms and intricate spatial relationships. He pursues this side path with dedication, regularly managing to publish his pictures, even as he avoids placing them within the photography world’s critical and curatorial purview. With this third instalment in the ‘Still Lifes’ series, he consolidates his position as one of the most notable designer-photographers of recent decades.